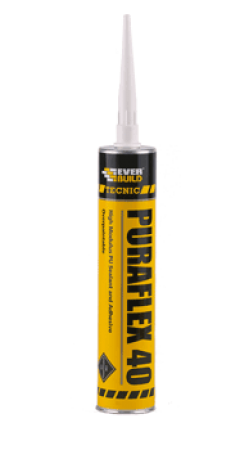 PURAFLEX 40 is a high modulus, one component, polyurethane hybrid based sealant and adhesive that remains permanently elastic and has good adhesion to most substrates. Bonds to concrete, wood, metal, aluminium, polyester, glass, uPVC, stone, ceramics, etc. Over paintable with gloss and emulsion paints – preliminary test required before use. CE Marked to types FEXT-INT CC and PW EX-INT CC. Solvent free (EMICODE EC 1PLUSR Very Low Emissions). Sealing and bonding metal panels and trim. Expansion joint sealing in concrete panels, floor joint and road and bridge construction. Sealing in applications subject to vibration and mechanical abrasion. Multitude of sealing and bonding applications in the construction and engineering markets. High traffic floor joints such as those found in garage forecourts, warehouse, factory floors, sports arenas, shopping centres etc. Can be over painted with oil and latex paints. It is specifically designed as an easy flow flooring grade for all concrete saw cuts and floor slab expansion joints, where abrasion resistance is required.